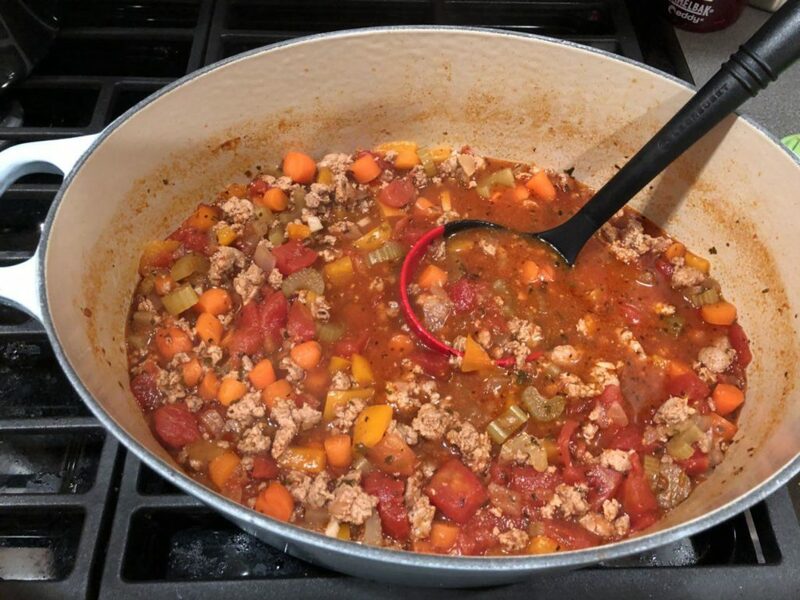 Italian Hamburger Soup – C is for Cooking! 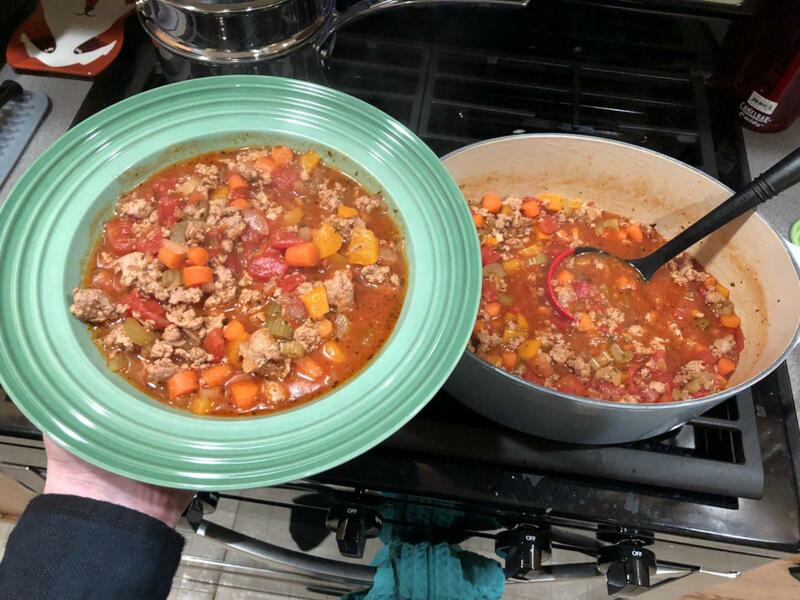 Take out two medium bowls (large enough for 2 cups of stuff), 1 small bowl (1/3 cup size) large general pan/skillet, Dutch oven, measuring cup, measuring spoons, and all ingredients. 1. Chop up 1 large onion. Put in medium bowl (“Bowl A”). 3. Put 1 tbsp of fresh basil (or 1 tsp dry basil) into small bowl (“Bowl C”). 4. Put 2 tbsp olive oil in skillet and turn on heat. 5. Add ground turkey and contents of Bowl A (salt, pepper, onion and garlic). Saute until turkey is browned and then transfer into dutch oven. Do not clean skillet. 6. In the same skillet add cotents of Bowl B. Saute until slightly tender and then transfer into dutch oven. Do not clean skillet. 7. Pour 28oz can of diced tomatos into skillet. Turn heat up to medium. Stir. 8. Add 3 cups beef broth, 4 tbsp tomato paste and all the contents of Bowl C (all herbs except parsley) to skillet. Add 1/4 tsp chili pepper flakes (optional). Stir and bring to a boil. Transger to dutch oven. 9. Stir contents of dutch oven. 10. Simmer on low heat 30min. 11. Add 1/4 cup fresh parsley and simmer additional 10-20min. Note: If you want it to be more watery, simmer only 30min total and add parsley at minute 25. 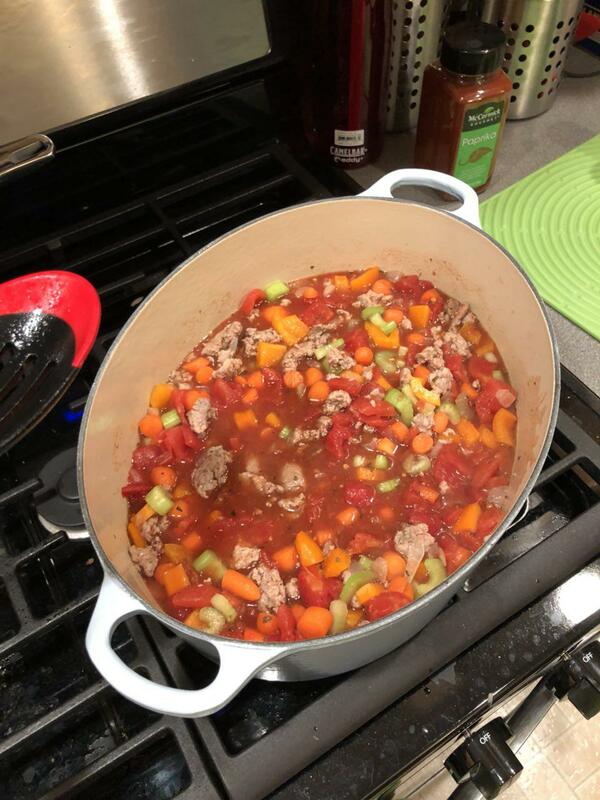 If you want it to be less watery, simmer for the full 50 minutes.